I'm sure most of you have heard about the Sudanese War and the Nuba people in the news. This tribe of people live in the foothills of the Nuba mountains of the Kordofan State of Southern Sudan. Because of a 22 year old civil war in Southern Sudan, these people are under attack and are starving because of the government and various militia groups. Today at 2:00pm my Pastor Dr. Greg Spears, Bobby Williams and a Nubian man named Nassir left for Southern Sudan to minister to the Nubian people. These three men are not only going to share the love of Christ with the Nuba, but will be providing food and care for them. 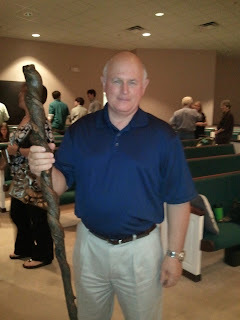 Dr. Greg Spears is also taking a very special gift with him: a Shepherd's Rod. This rod was found on his family farm and was naturally formed exactly as a shepherd rod should be. He asked me if I would put a protective finish of Boiled Linseed Oil on it for the road ahead, and I said, "Of course." It looks really cool. The point of this post is not to advertise that I finished the rod, but to ask you to pray for these three men. Dr. Greg will present the shepherd rod to a Nubian man (if the Lord reveals one) who can be a protector/shepherd and leader to these people. He will carry the rod just as Moses did with the Israelite people in the wilderness. Pray that the Lord will reveal someone to him and that the local government will let him take the rod through. Pray for their safety and their families back home in Memphis, but most importantly pray that the Lord's Will will be done no matter what. This is what they would want you to pray for. Below is a short paragraph from Dr. Greg Spears on what the Shepherd's Rod signifies in Biblical history. Thanks for reading. 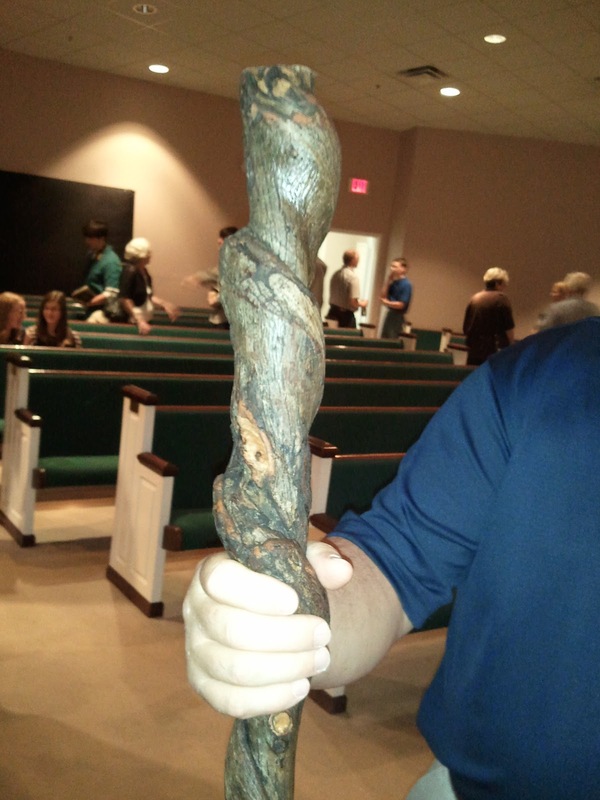 The shepherd's "Rod" is for protection. It is a weapon of defense with which the flock are shielded from the prowling beasts of prey. There is not a moment that danger is not near, and not a moment that Christ's Rod as the Great and Good Shepherd is not outstretched in our defense. There is not a being in the vast universe more exposed to assault, nor yet one more divinely and safely kept, than a sheep of His flock! But the "Rod" also speaks of Christ's discipline for His sheep. "Hear the rod, and Him who has appointed it." It is the voice of a Father, whose love for us is not a blind, unwise affection, but infinitely holy and intelligent. It is the voice of a Savior bidding us not to run from the pruning, but accept it as His design but to promote our fruitfulness. "He opens mine ear to discipline." And when the ear bends humbly and submissively to the Divine voice in this discipline of sorrow, then it may be said that, like Aaron's rod, it "brought forth buds, and bloomed with blossoms."